Sandlot Baseball: How to make practice fun. The sandlot baseball practice reminds me of one of my favorite movies...The Sand-lot. The movie brings back the times when neighborhood players would muster up and have a pick-up game at a local playground or open area. The days of pick-up style sandlot baseball games have largely disappeared. Mostly because organized youth baseball has really taken over. Youth Baseball Players are now conditioned to only play when they are with their own team and have a formal baseball uniform shirt in organized baseball. The other reason is that parents are not able to take their eye off their kids like they once did a couple generations ago. There are so many evil creeps out there lurking around playgrounds. The old days of gathering up the buddies and riding your bikes to the ballfield and playing ball for three hours are mostly gone. Parents mostly cannot let their kids go off on their own and trust they will be safe. We know players are rarely able to play baseball sand lot style. So we have to bring pick-up style to our practices and baseball camps. Players in all sports want to scrimmage. 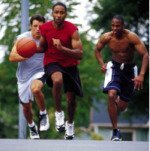 Basketball players want to have apick-up game. Three on Three, four on four, and any number of playground games. Football players want to scrimmage. Hockey players the same. Soccer players, volleyball players, softball players, and the sports go on and on. All the sports have their own versions of pick-up, sand lot style scrimmage games. Bring sand lot-style pick-up scrimmages to your baseball practice. Athletes naturally want to compete against each other. They want to play for something. On non-game days bring scrimmage competition to your practices. The three-team template is the best way to organize it using pick-up style baseball games. I have conducted dozens of baseball camps over the years in various areas of the country. What do you think is by far the favorite part of the camp? You guessed it. The sand lot scrimmage during the last hour every day. The second favorite part of the camp is the Kit-Kat- Catch game. This is another competition that centers around catching and throwing skill development. Do you want to really kill a practice? Then have your players spend hours of practice on several skill developing drills. Boring. Short and sweet. Get a few good reps in and move on to transition to another practice drill or practice competition. Bring competition to baseball practice plans disguises the drudgery and boring nature of the baseball drill. Sandlot ball ramps up the fun meter. Keep your instruction to a minimum: Direct teaching and long lectures are fruitless. You will lose them. Get your point across and get the sandlot games or practice plan competitions going. Keep the lines short: Too much waiting in line breeds off-task behavior. Keep the drill moving fast, do not stop to instruct too much and keep the lines moving. Use a large bucket of baseballs: Have at least two dozen baseballs in your buckets (four dozen is your goal). Have an extra bucket to drop the baseballs in so you don't have to wait as long between fungo hitting. More on Drills Kill Skills: Remeber, kids want to PLAY baseball just like the old days in the school yards and sandlots. Let the kids play baseball in simulated game conditions. Do you want to create enthusiasm with your players? Bring practice drills competition with pick-up style scrimmages to your practice. The Three-Team-Template gives you the blueprint. Your players cannot wait to come and will not want to leave.The Three-Team-Template gives you the blueprint. Your players cannot wait to come and will not want to leave.